Home » Association News » Endure or Disappear. This is the end of the 120 km Endurance ‘competition’ at Al Wathba in Dubai. FIVE riders were disqualified for beating horses. 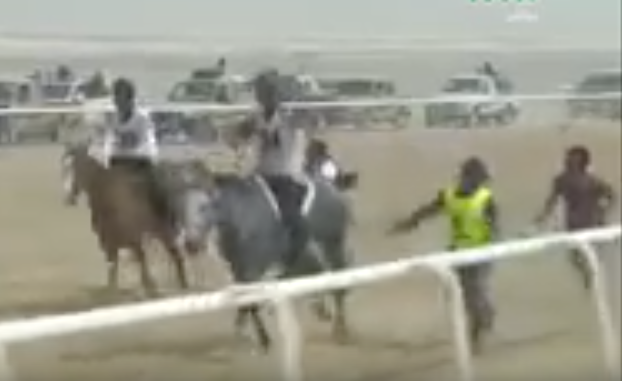 One rider/crew wasn’t reported in time for beating his horse, so wasn’t disqualified. There is no further punishment. This is difficult viewing, but it must be seen. One horse is reported as having sustained a CI (catastrophic injury) the end result for which should necessarily be euthanasia. Several horses just ‘vanished’ mid ride. No vet saw them, they didn’t return to the gates. Personally, I find this video more disturbing to see than the pictures of poor Bundy who was photographed stranded in the UAE sand during the Al Reef Cup last year with his two broken forelegs. Yes, of course I also found that disturbing, don’t get me wrong. 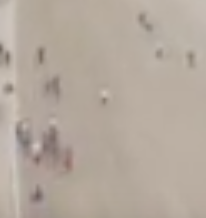 But this video shows even more clearly the lack of any kind of humanity, decency or empathy towards the horses. And then I ask myself: is it even possible to change such characteristics and turn them around into the norm we would so much like to see employed: the endurance horse as a partner, companion and priority to its rider/trainer/owner? Is the step from one to the other not simply too big? “Time shall tell”… but in that time horses keep dying, so how much time are we supposed to wait? Norm change is about the hardest and slowest kind of change possible in society. The only exception to this rule brought forth in social sciences until now is smoking, which turned from totally ‘normal’ to ‘unacceptable’ in just a few decades. I truly hope that UAE endurance can become such an exception, but still we’re talking about years and years before anything really changes. Firstly, there need to be people who act as norm entrepreneurs and commit themselves to carrying out the norm and convince important actors to adopt it. People willing to lobby, share knowledge and put pressure on actors who are important to further the norm. If, at some point, enough of these important actors have been convinced to adopt the norm, a tipping point can be reached. In this case it started with people frequently called ‘keyboard warriors”, but who in the meantime were very busy reaching out to such important actors such as the FEI and trying to convince them to adopt and carry out the norm. Something was set in motion: the EEF was suspended by the FEI, and new rules were imposed. But be warned: adopting new rules is something different from adopting a new norm (the definition of a norm is a “a standard of appropriate behavior for actors with a given identity” (Finnemore & Sikkink, 1998)). With the EEF new rules were imposed and thus adopted, but the behavior did not commonly change, which also become clear when looking at the large differences between current CEI and CEN, e.g. the amount of dead horses on CEN rides. Whether or not a tipping point has been reached in this situation is difficult to say, as unfortunately it is often the case in social sciences that only with hindsight everything can be clearly determined. But it is the case, however, that the most important actors, or a majority of the important actors, must have adopted the norm in order to transcend into the next step: norm cascading. Sheik Sultan, who has introduced the revolutionary new rules in order to protect endurance horses in his endurance village Bouthieb, can be seen as an important actor who can participate in popularizing the norm from within and get other to also adopt it. But was is clear is that thus far, he seems to be part of the minority of the important parties to carry the norm. 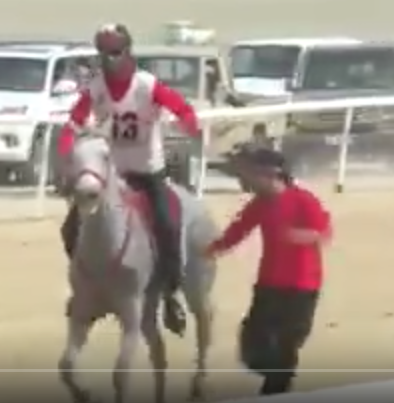 The biggest actor in UAE endurance, Sheik Maktoum, still does not seem to have adopted the norm. Nor does the EEF, which is responsible for endurance nationwide, as argued above. Or Sheik Hamdan, who is the idol of endurance in the UAE. As long as such important actors don’t go along with the norm, both by adopting and promoting it, norm cascading can never happen and neither can internalization. So what now? What can WE do to help this process along? We can lobby, put pressure upon the important actors by any possible means, and we can share knowledge. Also, we should not give them legitimacy and should take away their feeling of self-esteem when the norm is not applied. Legitimacy arises because the existing norm “the horse is an object to be used for winning by riders/trainers/owners” is accepted by everyone who stands by and watches without saying or doing anything. The feeling of self-esteem keeps existing because we still applaud and idolize those who win while using the existing norm. We have to stop that! Stop sending riders there from any outside nation, stop the world championships from happening there and walk away when someone who arrived with a horse looking almost dead steps unto a podium. Do we think the norm “the endurance horse is a partner, companion and priority to riders/trainers/owners”? is important? And do we have the balls to do something about it? I hope, from heart and soul, that a majority dares to answer YES to this question. Norms, generally defined as a “standard of appropriate behavior for actors with a given identity”, change in three different stages: norm emergence, norm acceptance also referred to as norm cascade; and internalization. The first two steps are separated by a so-called tipping point, which leads to a critical mass of relevant actors to adopt a norm. The most important mechanism driving the first stage is persuasion by norm entrepreneurs: people, parties or any actors carrying out the norm and trying to get others to accept, adopt and promote it. Through lobby, knowledge sharing and public pressure, these norm entrepreneurs to reach a critical quantity of actors needed to get to the tipping point, by persuading them to adopt the norm. The second stage of norm change is rather characterized by imitation. In this stage, the new persuaded norm leaders, in their turn try to persuade other actors to also adopt and promote the new norm. This is also referred to as socialization. The exact reasons for which socialization happens vary, but a combination of 1) pressure for conformity; 2) desire to enhance (international) legitimation and 3) the desire of leaders to enhance their self-esteem strongly facilitate norm cascading. At the far end of norm cascading, we can find internalization: the norm is accepted as being the new ‘normal’ and is no longer the subject of large public debate. In short: a norm needs to change from within as norm leaders set in a trend of socialization, but at the same time it is pressure from the outside is essential to the enablement of norm change. Please share this. Only a lot of pressure will change the status quo.